A grand undertaking, we hired extraordinary concert instrumentalists to help us document these instruments and utilized the finest engineers and equipment available to ensure the recordings are as accurate and as clear as possible. If you're looking for your first high quality solo instrument library or are looking to add a choice collection, IRCAM Solo Instruments offers a unique and comprehensive soundset unrivaled in quality. In collaboration with the famous IRCAM research department, this brand new collection presents the finest solo instruments (Violin, Viola, Cello, Contrabass, Flute in C, Oboe, Clarinet, Basson, Alto saxophone, French horn, Trumpet, Trombone, Bass tuba, Accordion, Guitar & Harp) played by the most talented contemporary musicians an captured in the very best conditions to ensure maximum fidelity. This collection not only contains the usual sounds of these sixteen wonderful instruments, but also some very rare playing techniques that you will not find anywhere else: multiphonic, aeolian, hit-on-body, buzz, crushed... Carefully programmed with expressive key-switches and other crossfading techniques, each preset can be loaded and played instantaneously whatever your system thanks to the supplied UVI Workstation. If you need a first library of high quality solo instrument, this collection is the perfect choice to start. If you already own other sound libraries, you will find on this one some unique sounds as well as some very musical usual sounds. The Ircam Solo Instruments collection is the result of a more than ten year of research, recording, editing & publishing. Started in 1996, this huge project involved the very best musicians, artistic directors and engineers. The instruments were recorded using Prism converters with several high-end and customized microphones. After intense experimentation, the decision was to use the sounds obtained via the close-proximity mono channel; because this is the most natural way to work with solo instruments, specially if you want to add external reverberation (like the superb sounding convolution reverb from the UVI Workstation). Sounds are stored in 24 bits / 44.1 kHz. 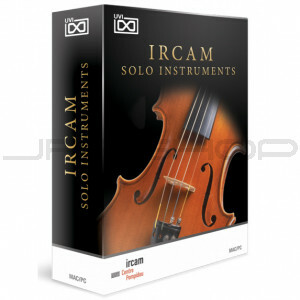 Even if the IRCAM Solo Instruments collection offers the most usable and musical samples, it also offer some rare and unique features : for exemple, the stringed instruments (violin, viola, cello and double bass), we recorded string by string, and you can choose the string you want for the note you want thru keyswitching presets. You will find also some rare to find transitions from different playing techniques like Sul-tasto-to-ordinario and Ordinario-to-sul-ponticello to name a view. Don't forget that the most important actors of this kind of project are the players; specially for solo instrument, where musical experience and playing techniques are essential. IRCAM did collaborate with the very best musician to achieve and exceptionnal and musical result. Each instrument, each sample has a soul. Soloist for the Ensemble InterContemporain since 1994, concertmaster of the Orchestre de Paris, and winner of several international competitions, Hae-Sun Kang is a professor at the Conservatoire National Supérieur de Musique de Paris. Violinist and violist, Pascal Robault won several international prices like the Evian International String Quartet Competition. He has participated in numerous concerts, exploring the most vast and varied forms of the chamber and contemporary music repertoires, performing with groups such as the Ensemble InterContemporain, Alternance, and Court-circuit. Instrument played: Caussin, France, end of XIX century. A former student of André Navarra and Bernard Michelin at the Conservatoire de Paris, André Ladrette developed a taste for early music, driving him to participate in groups such as Les Arts Florissants, La Chappelle Royale, La Grande Ecurie et la Chambre du Roy, Les Musiciens du Louvre, the London Fortepiano Trio, and, for fifteen years, the Stradivaria Ensemble directed by Daniel Cuiller. Instrument played : 3/4, Germany, end of XIX century. Member of the ensembles Court-circuit, Sillage, and Fa, he also performs on a regular basis with Ars Nova, the Ensemble InterContemporain, the Ensemble Modern, and the Ensemble Recherche. Didier Meu works in close collaboration with Ircam. He also created the Acrobass association, a group devoted to promoting instruments with a bass range and is also involved in projects where jazz and contemporary music intersect. Born in Portland, Oregon, Jens McManama performed his first solo concert at the age of thirteen with the Seattle Orchestra. After studying in Cleveland with Myron Bloom, he became the horn soloist at La Scala in Milan under the direction of Claudio Abbado. A soloist for the Ensemble InterContemporain since 1979, Jens McManama performed in numbers of pieces like the premiere of Karlheinz Stockhausen's In Freundschaft arranged for horn in Baden-Baden in 1988. Admitted to the Conservatoire national supérieur de musique de Paris in 1989, he won first prize in chamber music in 1991, followed by a first prize in trumpet performance the next year. Then he was invited to perform on a regular basis as a soloist at various festivals, and with prominent orchestras and groups. He has performed under the direction of Christoph von Dohnany, Sir Simon Rattle, Sir Georg Solti, James Conlon, Peter Eotvös, David Robertson... as well as Pierre Boulez. Benny Sluchin studied music at the Conservatory of Tel Aviv, his hometown, and at the Academy of Music in Jerusalem. Sluchin played with the Israel Philharmonic Orchestra for two years before becoming a co-soloist in the Jerusalem Symphony Orchestra (Radio Orchestra) where he remained for four years. Since 1976, he has been a member of the Ensemble InterContemporain, performing the contemporary repertoire. Benny Sluchin also gives master classes and conferences all over the world. Instrument played: Bass Tuba in F with 6 valves, Germany, manufactered by Fabien Levy. He has given numerous premieres and has been an invited soloist at many of the major contemporary music festivals. He has played with the Orchestre de Paris, the Orchestre National de France, and the Orchestre Philharmonique de Radio France, as well as in various jazz combos. From 1976 to 2001, Buquet was the tuba player for the Ensemble InterContemporain. Instrument played: SELMER Série2 n°434775 plated gold. Concert artist, researcher and teacher, Claude Delangle has expanded the contemporary repertory by working with the greatest composers of our time and by promoting recordings of their work on labels such as BIS, Deutsche Grammophon, Harmonia Mundi, Erato and Vérany. he has worked with Pierre Boulez, D. Robertson, P. Eötvös, K. Nagano, E.P. Salonel, and M.W. Chung. Delangle’s research on saxophone acoustics has resulted in a collaboration with Henri-Selmer-Paris in the creation of their prototypes. Catherine Bowie began her musical studies in her native New Zealand. Winner of the Young Musicians Competition, she entered the Conservatoire national supérieur de Paris, where she studied with Michel Debost and Pierre-Yves Artaud, A member of Ensemble Court-circuit from 1991 to 2002, she currently lives in New Zealand and plays with the Auckland Philharmonia. In October 1994, she was the winner of the fourth Tokyo International Oboe Contest. From 1992 to 1995 Hélène Devilleneuve played solo oboe for the Flanders Royal Philharmonic Orchestra. She then went on to become the first oboe super-soloist for the Orchestre philharmonique de Radio France in 1995. In the latter domain, she is a part of the ensemble Court-circuit and is regularly invited to play with the Ictus ensemble (Brussels), the Fa ensemble (Dominique My), and more. Instrument played : Buffet-Crampon Prestige 1996 using Fineber system. His interest in the contemporary repertoire has led him to premiere numerous concert works worldwide. As a soloist, Dutrieu has performed some of the most difficult pieces found in the contemporary repertoire such as the famous Dialogue de l’ombre double by Pierre Boulez. Pierre Dutrieu is a permanent member of the groups Court-circuit, S.I.C. and Sillages, and is regularly invited by other groups, such as the Ensemble InterContemporain. First place bassoonist at the Conservatoire national supérieur de musique de Paris, Laurent Le Chenadec has played the modern bassoon with the Paris-Bastille octet, the Ensemble InterContemporain under the direction of Pierre Boulez, and the group Court-circuit. Winner of numerous international competitions, she has given concerts all ove the world, and has participated in radio and television programs in Europe and in the United States. Although Tania feels her vocation is to spread knowledge of contemporary music, especially through premiering new works, her repertoire extends from early music to today's music. Instrument played : ZEROSETTE number B32C64T58 Levy special. Virtuoso with an impressive reputation, festival director, accordion collector, and lecturer, Pascal Contet isn’t afraid to take risks in order to make his instrument vibrate. He has improvised with Joëlle Léandre, Andy Emler, Jean-Pierre Drouet... also did some collaboration with Pierre Boulez. In 1969 Georges Pompidou initiated the establishment of the Institut de Recherche et Coordination Acoustique/Musique (Institute for music/acoustic research and coordination) entrusting its direction to the composer and conductor Pierre Boulez. IRCAM became, and remains today, the only center of its kind across the globe, dedicated to contemporary musical research and production and linked to the Centre Pompidou. Initially the project of one man, Pierre Boulez, composer, conductor and author of several works, the project to create IRCAM incarnated the utopian aspirations and aesthetic conceptions of its founder. His objective was to bring science and art together in order to widen instrumentarium and rejuvenate musical language. In the late 1970’s IRCAM offered the most advanced reflection into computer music in the world. With the arrival of Laurent Bayle in 1992, the institution opened its doors to new artistic forms and worked at attracting a larger public, notably via the establishment of the Agora festival. What’s more, anticipating the importance of the network, the Forum went online enabling IRCAM’s know-how to be accessed across the entire globe. In 2002, the philosopher Bernard Stiegler has taken over IRCAM’s direction, reaffirming the primary vocation of the institute: the coordination between research and creation. Seeking to renew relations between art and science, IRCAM’s project has both feet firmly based in contemporary questions such as the links between cultural industries and creation. Strongly supported by the presence of composers and artists invited to dialogue with the scientific teams, IRCAM contributes to debates incited by current issues, whether theoretical, musical, aesthetical or political. IRCAM provides a unique framework to welcome and coordinate various scientific ways of approaching music, including physics (acoustics, mechanics), signal processing, computer science, cognitive psychology and musicology. Activities are structured according to specific themes, entrusted to specialized teams. Each team assumes responsibility for all the work carried out within its domain: research, software development, contracts, collaborative projects, diffusion. The personnel working within IRCAM’s Department of Research and Development (90 researchers, engineers, post-graduates, technicians and administration staff) under the direction of Hugues Vinet, are organized into to the following teams.